The sun shone through the mist this morning, blessing my little corner of earth with ethereal promise. Daisy and I love feeding the horses at dawn. There's something magical about greeting those first morning rays. Last fall, we rode in an area known as Blindstream Ridge, on the southern edge of the Uinta Mountains. Steve, Boss, and Daisy were willing to venture closer to the dropoff. We rode across a huge plateau going and coming from the viewpoints. The orange is to make sure the hunters know we're not deer or elk. Many of my photos have horse ears in the foreground. I could crop them out, but I think it adds interest and maybe puts the viewer in touch with my horseback position. In spite of crossing some dirt roads, we were all alone on this ride, just us, big country, and big sky. To see more Big Sky, click here. Our Daisy Mae loves to fetch. She's a lab. It's in her DNA. "I'm ready! I'm willing! Throw the dang frisbee, already!" "Okay, the frisbee's in the air! I see it!" "I've got my eyes on it!" "Total concentration now. Nothing's getting between me and that disk!" 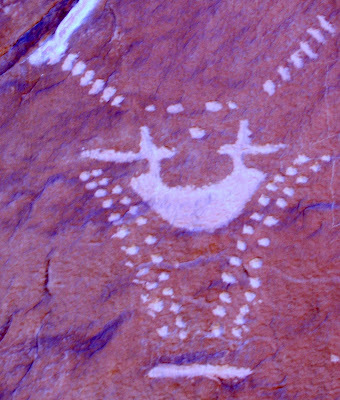 "I'm here, I'm ready, I've..."
If you're exploring the state of Utah, don't miss out on the wonderful Native American rock art. These photos were taken in spring and fall, the best times to visit semi-arid areas. Above are petroglyphs, etched into the rock. Below is an example of a pictograph, painted onto the surface, found on Jones Hole Creek, called the Deluge Shelter site. Excavations in the area indicate intermittent occupation for the last 7000 years. These are just a few examples from the Fremont culture. Look for native rock art anywhere there is a water source and a good flat rock panel. For fascinating photos from all over the world, go to That's My World! Most of December, all of January, and most of February is cross country skiing time around here. The weather is too cold and the snow too deep for trail riding, so the horses get a rest. By early March, we'll start riding at lower elevations (around 4500 feet) in the desert, pinyon-juniper country. By July/August, we'll move up to 11-12,000 feet in the Uinta Mountains. From wildflowers through the changing aspens, we'll make the most of high country rides. until the snow falls in the desert once again. We're lucky to have such diversity, all within an hour's drive of our house. And all of it under cover of the big, beautiful western sky. To see more skies all over the world, go to Skywatch Friday. Take heart, friends. Only two months 'til spring! Re: previous post, Frost Crystals. Thanks to Arija for referring to my white horse as a unicorn. I've always wanted one of those! Thanks to EGTourguide for providing a scientific definition of hoarfrost, "Ice crystals formed in super-saturated air." Several folks offered suggestions for renaming my subject matter. Tess gave me "sparkle magic." Rob calls it "winter magic." But my favorite came from Gaelyn. I hereby wave my Good Witch of the West wand and change the name of hoarfrost to "fairy frost." Crystalline magic encases my world and takes my breath away. The temperature hovers at zero, but winter's surprising wonderland makes me forget chilled fingers and toes. To see the beauty of other worlds, click here. The above photo was taken right after we completed our first hay mowing last summer. From a clear sky and a sunny skies prediction, the wind picked up, the heavens darkened, and we feared we were in for a downpour on our newly cut crop. Fortunately, the Great Spirit gave us a break, and only a few sprinkles fell from the angry-looking clouds. A few days later, Farmer Sam and Sammette (Steve and I) had a successful baling with good dry hay. Our horses are still munching on the results. For more great photos, go to Skywatch Friday. I read an article in the Wall Street Journal (by Daniel Henniger) a couple of days ago about a unique New Years Resolution: Don’t Be Stupid. Mr. Henniger was referring to our economic crisis and avoiding the stupidity, dishonesty, and naivety that got us into it. But I'm not a global financier and can't do much about that mess, so I'm just going for the basics. I'm taking the resolution at face value and adopting it for my very own. On so many levels, "not being stupid" would lead to the perfect me. I wouldn’t forget anything, I’d make great decisions about where to go when, I’d pick good investments, and avoid worthless purchases. With my new-found smarts, I’d be a virtual paragon. I'd become an excellent cook, never neglecting the pasta until its burned, always having the correct ingredients on hand. I'd keep a clean house and the pictures on the wall would never hang crooked. I would handily train horse, dog, and husband to be just as perfect. I’d wow my kids. And, of course, I’d say all the right things to friends and family, never screwing up and insulting someone unintentionally. In other words, no flaws. 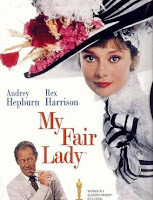 In the immortal words of Eliza Doolittle, wouldn’t it be lover-ly? Here’s Daisy Mae (at six weeks old) meeting Boss, the big guy. The pair have been friends ever since. Boss allows Daisy to use his tail as a fly swatter, rest in his shade, or follow at his heels. If she gets in his way on a ride, he’ll gently push her aside with his nose. If he comes up to her resting in the shade, he’ll put his head down to check on her. If a pair of different species can get along so well, why do we humans find so much to disagree about? Go to My World Tuesday to see a cornucopia of fascinating photos. The full moon rose a few minutes past sunset last night, while pink still tinted the sky. Clouds on the horizon obscured it at first and added mystery as the sky grew darker. There is something infinitely healing in the repeated refrains of nature ~ the assurance that dawn comes after night, and spring after the winter. For more great images, go to Skywatch Friday.